The air is shimmering like in the desert, while just a few metres away, it’s so cold you can build a snowman. And there’s a category 5 hurricane in the next room. Welcome to the “Weather Factory”. Ford’s new state-of-the-art Environmental Test Centre puts all the world’s weather under one roof, enabling engineers to test forthcoming vehicles – from a small Ford KA+ to a two-tonne Ford Transit in the most demanding conditions and make whatever weather they want at any time of the day. Altitudes higher than Mont Blanc, the tallest Alpine peak, vehicle and wind speeds of up to 250 km/h (155 mph), snow, glaring sunlight and rain are among conditions that are a push of a button away in Europe’s most advanced automotive environmental test centre. The subject of a €70 million investment, the test centre offers the first automotive wind tunnel that can simulate 5,200 metres, the same elevation as the Mount Everest North Base Camp, and the first with such a range of conditions that can be simulated under one roof. The facility can also cool two rooms to – 40 C and heat them up to 55 C, as well as generate 95 per cent humidity. 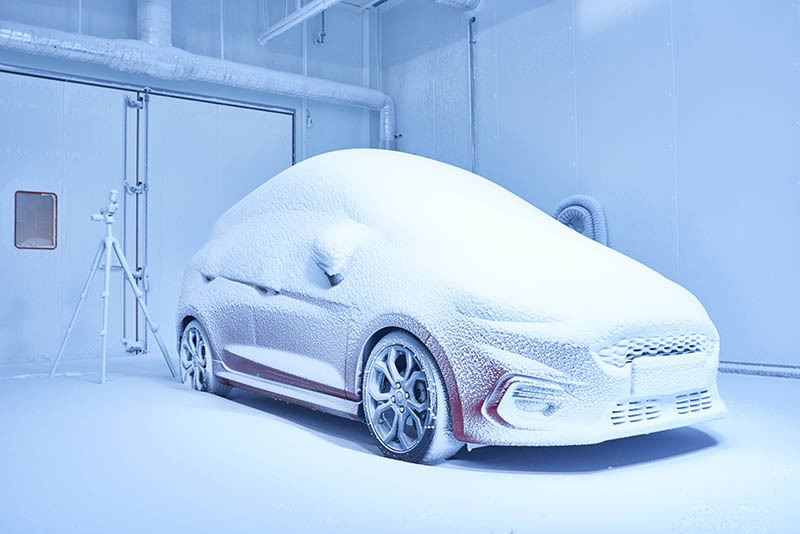 The temperature extremes make the facility at Ford’s John Andrews Product Development Centre in Cologne, Germany, the hottest, coldest and most humid place in Europe, and home to the highest point in Western Europe. All Ford vehicles will be tested in the facility, which features three climate wind tunnels, including a high-altitude lab, and four temperature-controlled test chambers, one of which will also facilitate humidity testing. “We can see how windshield wipers function in Arctic temperatures, how engine performance changes in extreme heat and cold, and even how much snow falls on the driver’s head when they open the door. It’s an engineer’s dream,” said Michael Steup, project manager, Environmental Test Centre, Ford of Europe. Overall, the facility requires 11 megawatts of electricity, enough to power a small town of 2,400 inhabitants, that comes from a fully renewable, environmentally-friendly source. The electricity provided by RheinEnergie originates from certified sustainable sources in Scandinavia and covers the complete electric power demand of Ford’s facilities in the city.